Jarrett Davis looks like any other college student loading up plastic storage bins onto a hand truck to haul them into his new dorm room at Augusta University. But the place where the first-year student at the Medical College of Georgia will now lay his head is much different than the residences he might have found in previous years. 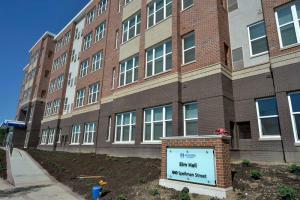 Graduate students like Davis began moving in Thursday into the newly opened Elm Hall on the Health Sciences Campus. Oak Hall next door, for undergraduate students, will open Aug. 13. Together they will house more than 700 students, which is a net gain of about 500 beds from the housing the campus previously had, said Mark Allen Poisel, AU’s vice president for enrollment. “Not to mention a quality gain that is very different” from the previous housing, he said. “We had 40-year-old buildings compared to apartments that we designed with specialized students and programming in mind” in the new buildings. Those buildings and the spaces within them are very different, Poisel said. The graduate and professional dorm, which will house about 300, is almost all studio and one-bedroom apartments with full kitchens, compared to the undergraduate buildings where students will mostly live together in suites and share large common kitchen areas, he said. “What we really wanted was an opportunity for students to have their own individual experience, knowing that graduate and professional students don’t necessarily want a roommate,” Poisel said. After having roommates all four years at Georgia Tech, that is something Davis is eagerly anticipating. “That’s going to be really nice,” he said. The buildings will also have different looks, Poisel said. The undergraduate building will have brighter colors and murals on the walls and the big common areas with kitchens will be places where “they can play Xbox, they can hang out and eat, they can gather,” he said. The graduate building has more muted and wood colors and will have artwork on the walls, Poisel said. It is also part of the school’s push to provide more housing on campus and create more of a residential campus experience. With the opening of the two buildings, plus the older University Vil­lage on the Forest Hills Cam­pus, the bed capacity at the university will increase to over 1,200 from 700 or so the previous year, Poisel said. While the graduate and professional programs generally don’t grow because they only have a certain number of slots, the university’s growth strategy would be with incoming freshmen and transfers, Poisel said. And while it is still very early, it appears to be moving in that direction, he said. The biggest advantage to living on campus is obviously the location, Davis said. There really might be only a small downside, Davis said. “Maybe that my mess is my mess and I can’t blame it on any roommates I don’t have,” he said, laughing.